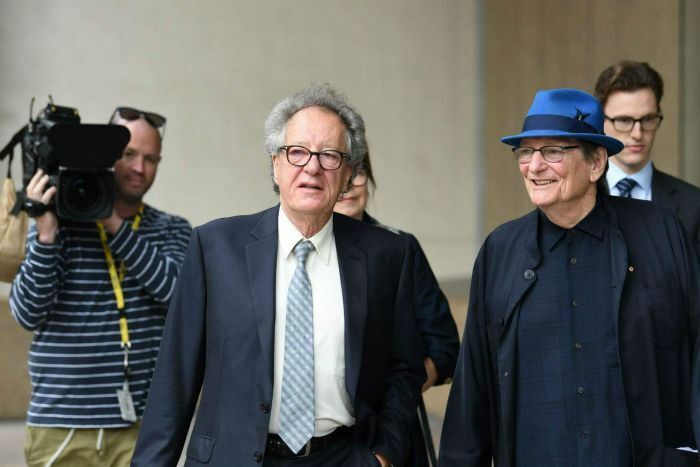 The actress at the centre of Geoffrey Rush’s defamation trial has told a court her older female colleagues in a Sydney Theatre Company (STC) production “enabled” his alleged harassment. Eryn Jean Norvill today stepped back into the witness box of the Federal Court in Sydney as the key witness for the defence case. She claimed a culture of bullying, harassment and “normalised” inappropriate behaviour existed within her industry. Mr Rush performed the title role in the 2015-16 season of King Lear with Ms Norvill playing his daughter Cordelia, along with Robyn Nevin who played The Fool. The Daily Telegraph is being sued by Mr Rush over stories last year that suggested he behaved inappropriately towards a younger colleague, who was later revealed to be Ms Norvill. Mr Rush’s barrister Bruce McClintock SC pressed Ms Norvill on her evidence from yesterday that the rehearsal room was “complicit” when Mr Rush allegedly made sexual gestures towards her. He questioned whether she was also referring to Ms Nevin in that statement. Ms Norvill said she and Ms Nevin were from different generations and insisted that Ms Nevin had enabled the alleged behaviour. Mr McClintock asked Ms Norvill whether she would consider it a “betrayal of the friendship” to suggest Ms Nevin was complicit in alleged sexual harassment. “No, I don’t, I believe actually it’s deeply respectful,” the actress replied. “To speak the truth is very respectful, yes I will speak the truth to her. Justice Michael Wigney asked Ms Norvill what she meant by “complicit”. “There was a culture of bullying and harassment in that room and in my industry,” she said. Ms Norvill said she believed colleagues knew about the alleged harassment but were too frightened to speak up. During his cross examination, Mr McClintock questioned why key claims Ms Norvill made in court were not in a statement she signed in August. They included her claim that Mr Rush was sharply reprimanded by director Neil Armfield during rehearsals when he allegedly made sexual gestures over Ms Norvill while she was lying down with her eyes closed. “Perhaps it was something that came to me later,” Ms Norvill said. Also not included was Mr Rush’s alleged use of the words “scrumptious” and “yummy” to describe his younger colleague. “I’ve had to think over this time in my life again and again and again and again and those words came to the fore,” Ms Norvill told the court. She claimed she had omitted allegations Mr Rush rubbed her palm and fondled her hands because she was unsure whether it constituted a crossed boundary, but later realised it was relevant as context. Mr McClintock accused Ms Norvill of fabricating allegations about Mr Rush which she aired during a meeting with STC’s Annelies Crowe. “What I want to suggest to you is you told Ms Crowe … a whole pack of disgusting lies about my client. Do you agree with that, or not?” Mr McClintock asked. “No I don’t,” the actress replied.